Part I: Accessible and Inclusive Urban Development, 11 June 2015, 1.15 to 2.30 p.m., CR.6, UN Headquarters. Part II: Operationalizing the post-2015 development agenda for persons with disabilities, 12 June 2015, 10 a.m. to 1 p.m., CR.4. UN-DESA/DSPD Public Forum in Sendai: Taking action toward a disability-inclusive disaster risk reduction framework and its implementation, 15 March 2015, Tohoku University. 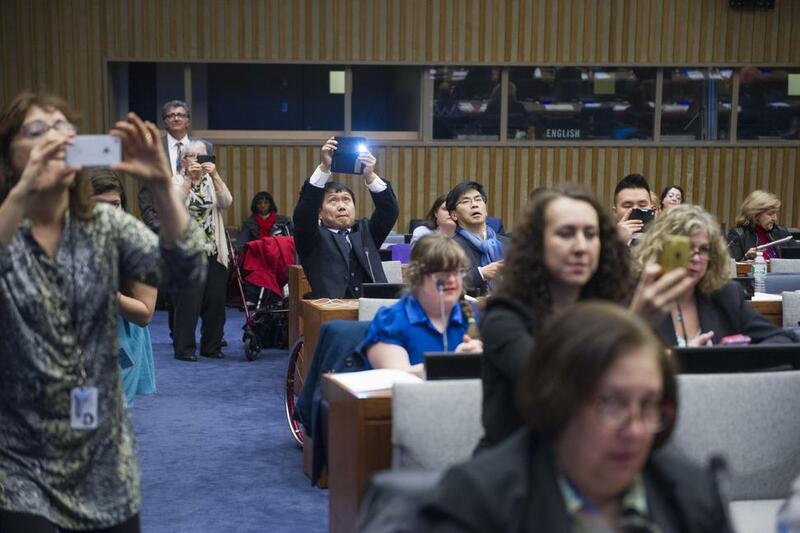 Roundtable Discussion on Disability–Inclusive Disaster Risk Reduction and Resilience, 11 June 2014, 1:15-3:00 p.m., UN Headquarters, New York, by UNDESA and Government of Japan. DESA/PACRIM Forum on Accessible Tourism for Inclusive and Sustainable Development, Hawaii on 17 May 2014, by UNDESA in collaboration with the Secretariat of the Pacific Rim Conference on Disability and Diversity and University of Hawaii. Dialogue on the Post 2015 Development Framework and Disability, 19 to 20 July 2013, UN Headquarters, New York. What are DESA DSPD Forums on Disability and Development? The United Nations Department of Economic and Social Affairs (DESA) has long committed to advancing inclusive, equitable and sustainable development. The DESA Forum on Disability and Development – an initiative of the Division for Social Policy and Development (DSPD/DESA) – aims to contribute to this objective, through facilitating policy dialogues, exchange of expertise, good practices and solutions, innovative ideas on inclusive development, and through promoting international cooperation and partnerships. The first DESA Forum was held at United Nations Headquarters in New York, from 19 to 20 July 2013, under the theme “Dialogue on the post-2015 Development Framework and Disability.”. It featured a high-level policy dialogue on issues and opportunities for including disability in the emerging post 2015 development agenda as well as panel discussions on pertinent issues. Ongoing, DESA/DSPD Forums are held in conjunction with annual sessions of the Conference of State Parties to the CRPD and also along with key regional and international conferences and meetings. Synthesis report on consultations on the post-2015 framework on disaster risk reduction (HFA2), United Nations Office for Disaster Risk Reduction (UNISDR), 2013.